Our home in OceanoHome again! We arrived in Oceano on June 27 after 51 weeks on the road. This completed the Fall Color Tour. We got the same space in the same RV park we were in last year. 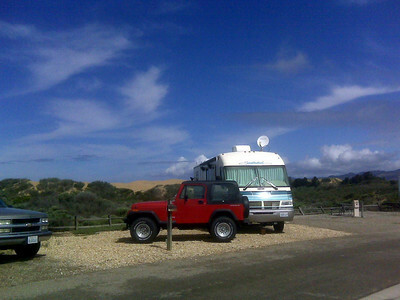 It's the best spot in the park with the edge of the Oceano sand dunes and no neighbors outside our front door. There are no plans at this time for our next trip, but I'm sure inspiration will come soon. There is quite a bit of work to do on the motorhome before it's ready to hit the road again. We will take care of these tasks while here this summer and hope to be ready for some short getaways by fall, 2010.